Hard-boiled eggs: Why you should never actually boil them. Whatever you do, don’t boil this. In this season of beitzahs and PAAS dye kits, it may be time for a friendly reminder about hard-boiled eggs: You’re not actually supposed to boil them. Hard-boiled eggs may seem too basic to warrant a PSA, but misinformation abounds. Just the other day, a bright, culinarily astute friend casually mentioned his egg-boiling technique, which he described as “traditional,” and which he seemed to think was socially condoned: Bring a pot of water to a low boil, add your eggs, and cook them for 10 minutes over medium heat. Granted, his mistake is understandable—the very name “hard-boiled eggs” cruelly and ironically perpetuates the myth that the thing they describe should be boiled. But following my friend’s method yields unevenly cooked eggs: The whites, battered by the incessant kinetic energy of the water molecules, become tough and rubbery. The yolks, meanwhile, buffered by albumin, remain half raw. (Of course, you could boil the eggs longer than 10 minutes to get fully cooked yolks, but by that point your whites would have the texture of a foam yoga mat.) Eggs cooked this way cannot rightfully be called hard-boiled—they are half-hard, half-soft chimeras. Furthermore, cooking eggs in boiling water disturbs whatever domestic tranquility you have carefully cultivated in your kitchen. Boiling eggs will rattle disquietingly in the pot, jarring your nerves (which may already be tattered either by Easter Bunny-crazed children or by not having been able to eat bread for several days). You might as well put on Steve Reich’s Drumming. 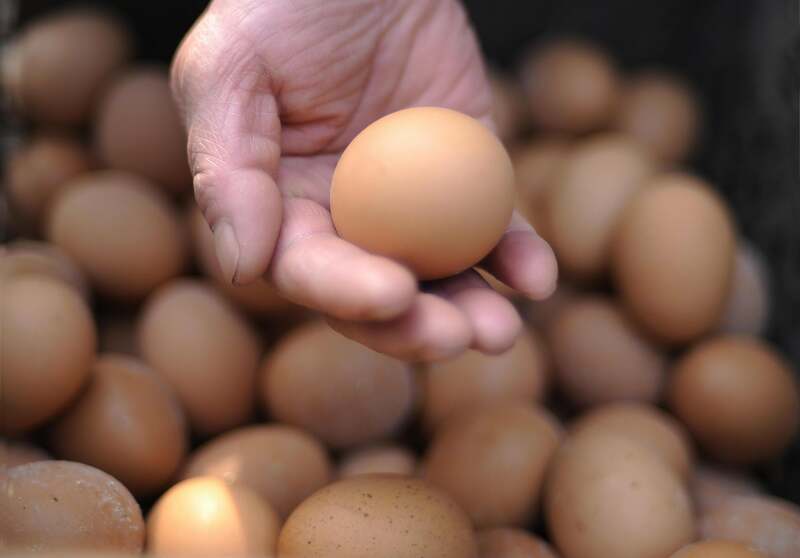 In addition to being an aural nightmare, clattering eggs are liable to crack, thereby defeating the purpose of cooking them in the shell in the first place, and ruining them as a clean slate for dying or charring. The correct way to make hard-boiled eggs is much more pleasant: Put your eggs in a pot with water, and partially cover the pot. Bring the water just to a boil over high heat. This is the hardest part, both because of watched pots’ notorious stubbornness, and because it can be difficult to judge what degree of steaming and frothing actually constitutes “a boil.” To be safe, wait for three large bubbles to burst on the surface of the water. Turn off the heat immediately, and cover the pot fully. Let the eggs rest, silently and peacefully, in the water for 10 minutes. Finally, transfer them to a bowl of cold water to cool them down and make them easier to peel (although ease of peeling, as the Food Explainer has Explained, has more to do with egg age than with egg-cooling technique). Some controversy surrounds the proper amount of time to let the eggs bathe in the hot water after you’ve turned off the heat; I’ve seen recommendations ranging from 9 minutes to 13 minutes. But 9-minute eggs are too loose and woozy to qualify as hard-boiled, while 13-minute eggs suffer from the same rubbery-white problem as eggs that have been boiled—with mildly chalky yolks to boot. Ten minutes gives you the best of both worlds: firm but tender whites, soft but thoroughly pale yolks. Of course, if you’re boiling eggs for purely decorative or symbolic purposes, you may not care what they look or taste like within, and you’re within your rights to let them steep as long as you like. But if there’s any chance anyone will nosh on your ovoid holiday trimmings, keep your eye on the clock.